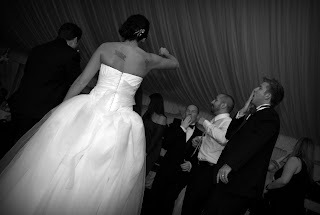 Wedding Photographer: A tough gig. from this past November's wedding. 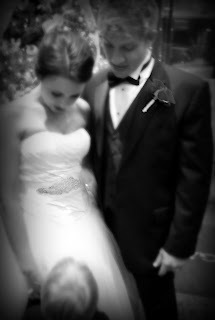 Last October, I was asked by a long-time friend to photograph his wedding. He is in the Navy and was "shipping" out to Japan in just a few months prior. It was a very small wedding in his parents' backyard. And it was about a month before his wedding. And he knew that I was teaching photography and had experience. "I am very honored, but I am not an event photographer. I highly suggest you find a photographer who is experienced in that type of photography. If you still can't find anyone, I would be happy to help you out." Oh boy... here we go! A moment with their son. When it comes to subject matter, however, some of my very favorite shots have been when I am in a space with people, and just try to tell a story through a series of photos. Wedding photography is a perfect example of this. Except that... someone's most momentous memories are being captured. You can't get back that first kiss as husband and wife. You can't ask them to "redo" the walk down the aisle! If I miss that moment... that's that! 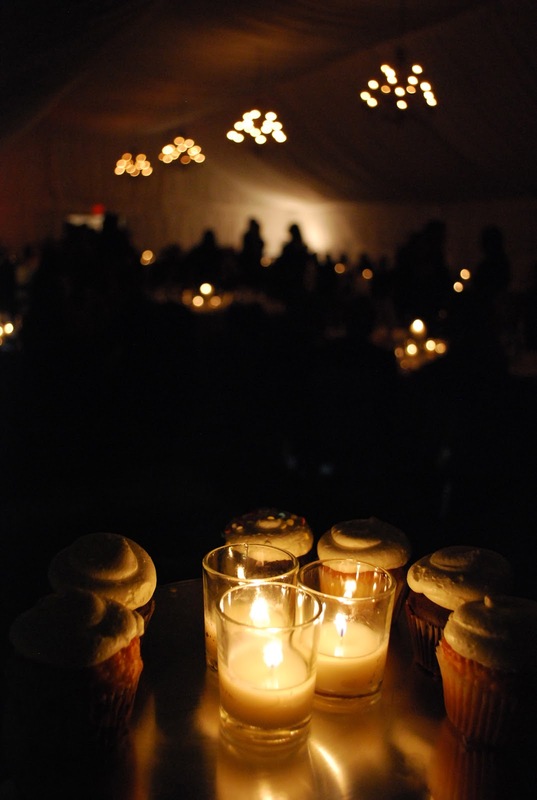 Well, that October wedding was a beautiful and intimate success. The weather was amazingly warm without a cloud in the sky. This new experience went better than I thought, despite my anxiety. 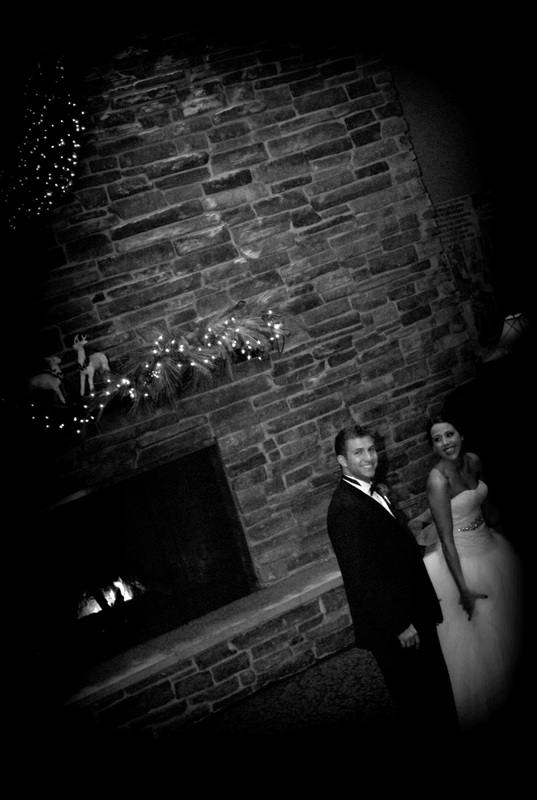 Some of the biggest challenges from that wedding had to do with lighting and space. I was able to get some really fantastic getting ready shots, and detail shots. The ceremony was set against the back of the house, and at the time of day, the sun came streaming over and was very harsh. This did make it difficult to get softer shots. Also, the reception at the restaurant was in a very narrow room with incredibly tall ceilings. This made bounce light very difficult, especially since I was moving in and out of very tight spaces. When going through the photos afterwards, I was really pleased with the amount that I was able to provide for them. I spent a lot of time afterwards manipulating and adjusting to give them a wide variety of traditional and artistic shots. One of the biggest assets you need to have is confidence. And even still... I was very confident in the shots I took. 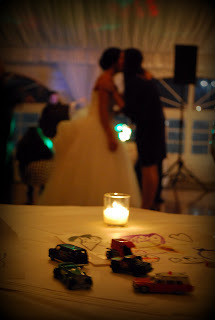 I really loved some of the moments I captured, and how I adjusted some to look so soft and artistic. But again, I am seeing everything through MY eyes, not theirs. I had to feel confident that my clients trusted my vision from what they saw in my previous work. I had to be confident that when they said they were happy with the photos, that they really truly were happy with their photos from their big day. This was a shot I grabbed after their posed photo "session." I just thought it was too cute to let go to the wayside. A year later, I received an email from my friend's younger brother. He was getting married in Tennessee and was having a second reception in Chicago. He said that his brother was really happy with the photos I had taken of their wedding and so suggested that he contact me. I responded exactly the same way: I am not an event photographer. I highly suggest you find a photographer who is experienced in that type of photography. If you still can't find anyone, I would be happy to help you out." This past November, I shot his wedding reception. 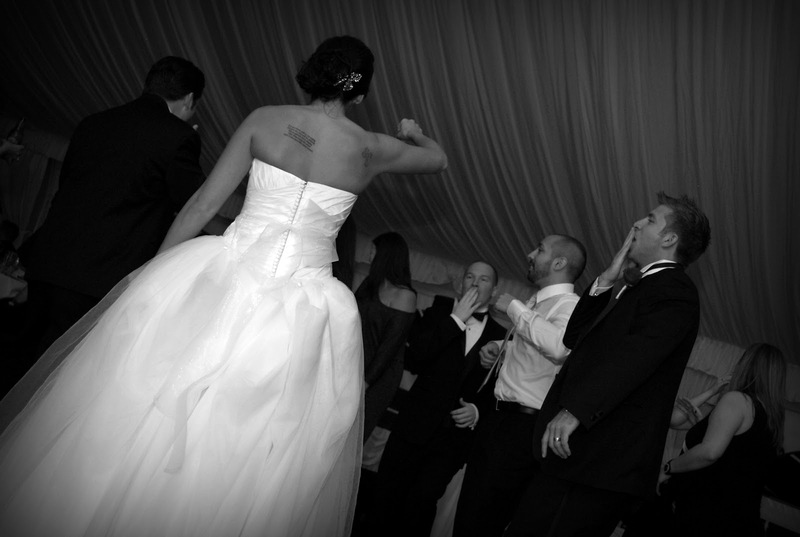 It took place at the Stonegate Banquets in Hoffman Estates. It was absolutely beautifully decorated with lit Christmas trees, garland, and candles. This was a much bigger event than previous, and it was in a much bigger reception space. One big difference was that it was in a tent, so there was a lot of white everywhere. You'd think this would give great bounce light, but it was not as easy as I had expected. This is a more typical photojournalistic style photo I take throughout the event. I am SO glad I brought so many extra batteries for my speed flash because the lithiums became very hot very fast which significantly slowed my repetitive shots. I ended up swapping out the batteries more frequently than anticipated, but luckily I had a pants pockets (a definite must have when shooting an event!) to stash the batteries. One major job hazard is burning your fingers on those batteries. Yes, they get THAT hot! Quick reflexes are also very important. You need to be able to look fast, react fast, and adjust fast. You need to be flexible to your clients' needs, and be ready at any moment to change your settings, or your mindset! Special moments, with major personality. the cars in a shot like this? I JUST finished going through all of the shots and I pulled a few of my favorite photos that I played around with to add a little extra artsy touch (though the "client" will receive all of my unadjusted photos as well). I thought I would share a few of my less traditional shots with you here! So what have I been doing since November? I also could not resist adding this little chart my husband found while I was going through each photo and adjusting. What a patient man (because this is SO true!!). Another gift this year that I focused on making was a family coloring book for the nieces and nephew on my husband's side of the family. I have been planning on making this book for a while now, but as we know how time gets away from us, I was able to finally start on this project in late October, early November. Again, I thought... I only need to make ONE and then just make copies for all of them! First, I had to get photos of the kids. What's so great about my family (on both sides) is that there seem to be some pretty great photographers! This does make it easy to get a hold of great, artsy photos that are "in action" as opposed to all staged. Thanks to Bess Williams, one of my sisters-in-law, I was able to grab a few really great close-up photos she had taken of the kids. 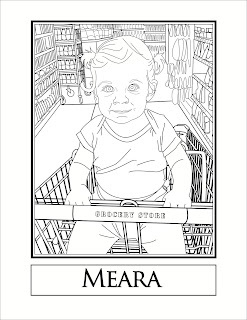 Remember that coloring book project I did with my students when I was student teaching the computer art class? Well, I approached this project in a very similar fashion. I used the photos I had, placed them into an illustrator page, templated that layer, and then drew the images on a separate layer. One thing that is great about just doing this type of drawing is that you don't have to have any connected shapes (since I wasn't filling anything). So I could just click, click, click away. A tricky situation is making sure that the people really do look like themselves in cartoon form. I did turn on and off the template layer a bunch as I went along to make sure the lines made sense in this simplified flat format. This process took more time that anticipated with less pages than I had originally wanted. This is probably more likely because I am a bit of a perfectionist, and so I kept on adding and adding and adding more detail. 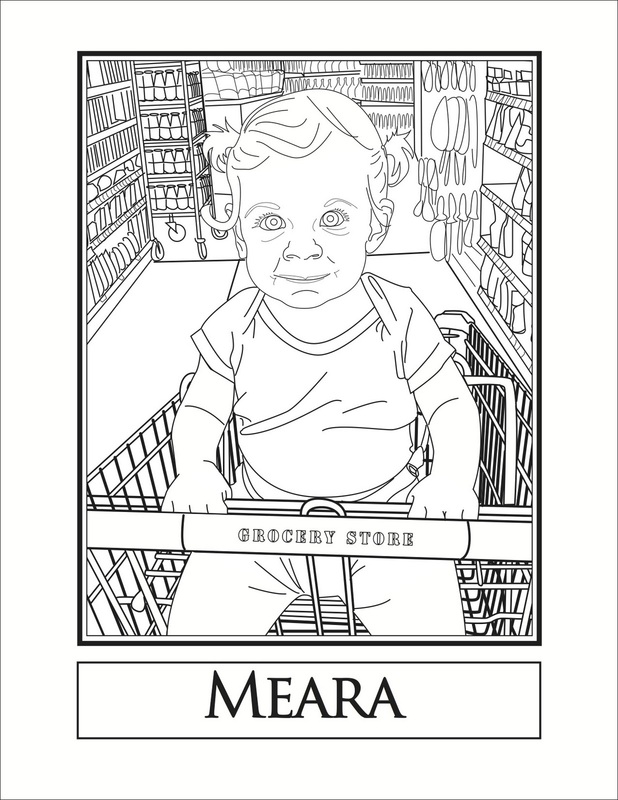 There are a few ways that I had in mind to finish up and bind the pages of the coloring book. On the previous books, I had put two images per page, and then folded the book and stapled the middle crease. For this one, I wanted the images to be "full" size (in this case they are about 7.5" x 9.5"). So I thought about having them bound by Kinkos (or the like) using that binding tape on the end. Instead, I ended up printing the pages from my ink jet, and binding them using a 3-hole-punch and brass tabs. Not the prettiest of closures, but for the first coloring books, I think it is fine. The nice part about it being brass tabs, is that I can always draw up new pages and punch and send them... and the coloring books can just have added pages, like an ever-growing book. I also can keep printing off the whole book of pages, so the kids always have more (and the same) pages to color (differently). Ideally, I'd like to add pages of the aunts, uncles, and other extended family members. For now, the cousins get to know the cousins. 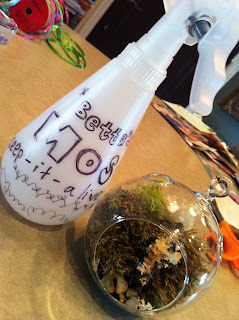 Matt's moss terrarium with my mom's personalized spritzer. As I mentioned in a previous post, I'd like to add a few KUDOS out there to my artist friends by whom I am inspired. This post goes out to Matt Milkowski, and is themed along with some prior posts about holiday gifts. As the season came closer and closer, I became more and more unsure of what to give this year. Luckily, I get to work with... well, working artists (one major pro about being an art teacher). My coworker, Matt, is a very humble man, and incredibly talented. He had been working, unbeknownst to me at the time, on creating terrariums. The first thing that came to my mind was, 'terrariums? 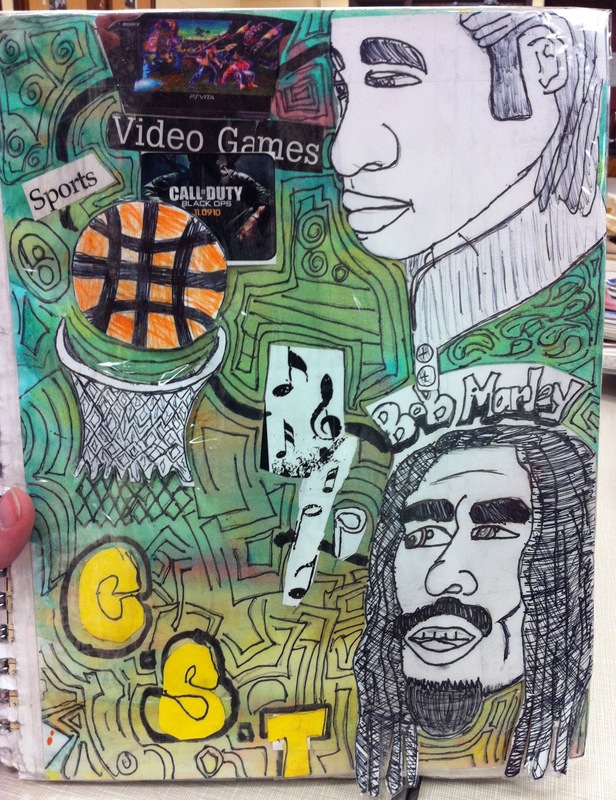 Like what we made in elementary school? Like, the little plants inside a cut up 2 liter bottle of coke?' Well, indeed, that is what he makes, but FAR more artistically and sophisticated than what I had envisioned. Matt was telling me about his terrariums because he was in the midst of preparing for the Bucktown Holiday Art Show where he would be selling his terrariums. I said, "Hey Matt- send me some photos!" And so... I said, "Hey Matt! I want to purchase some of those!" Originally I really wanted a moss one for my sister. As a kid, my sister and I used to dig up the little caterpillar type moss we found in the cracks of the sidewalk and "plant" them in the dirt and lava rocks we set up in some big old fish bowls. However, instead I purchased the moss for my mom, from whom I inherited my "brown thumb". This was a perfect gift for her. It was so beautiful in that glass vessel (which can be hung! ), and it is so low maintenance. The only addition that I squeezed in with my personal touch is the spray bottle. 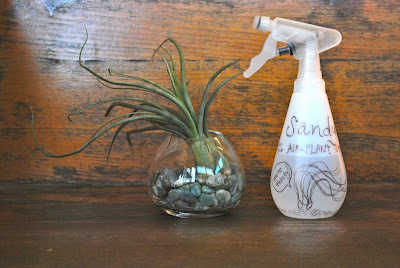 The one I did end up purchasing for my sister was this crazy air plant! First of all, I had no idea what this thing was. Matt explained to me that these plants can live anywhere, like a bookshelf, or even pinned on my sweater! 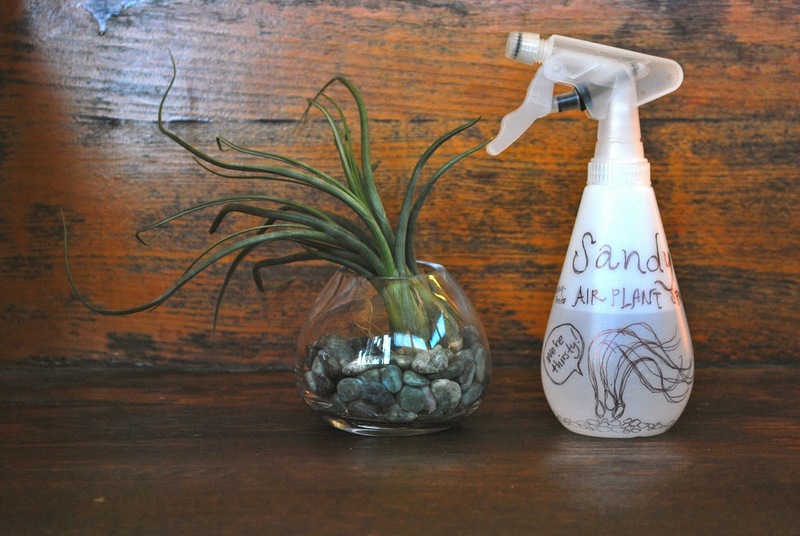 They do not need dirt to live! This still blows my mind. Again... I have a brown thumb. My sister had been a landscape architect in her previous career, so I thought she would not only appreciate this really cool plant, but also its very artistic asymmetrical balance. And of course, I personalized a spritzer for her as well (thank you, Target- in the travel items area!). 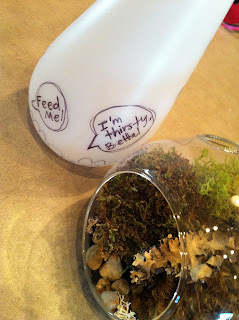 I couldn't help to purchase a few more of these really fantastic terrariums as a few more gifts as well. Matt sells much larger terrariums as well in some incredibly interesting vessels (like mason jars and coffee shop syrup containers!) that really make his work unique. So this year I decided to (yet again) attempt to make all of the Christmas gifts for the kiddies in the family. In my vow to spend less money, I end up tipping the work load scale to the deep end of no return. Why do I do this to myself? Because I think this will be fun, and easy, and... better than trying to go shopping in the madness of consumerism? 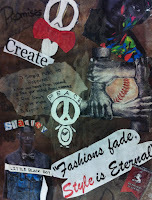 So for a while now, I've been working with collage. We all know about the very elusive and secretive encaustic project I've been working on (and vow to be complete with in the next week! I promise!). And a few years ago, I made those photoshopped "fabric" collages for my nieces and nephew on my husband's side for Christmas. This year, I've been planning on continuing my vintage collage theme by creating fabric collaged pillows! So, I had a plan for these pillows to look very similar to my previous styles. However, as many of us know, art is (in my world) incredibly organic and always flexible to change. her pillow after receiving it this Christmas. I began my niece's (and goddaughter) pillow by spending some quality time at JoAnn Fabrics. Again... not a place you might want to hang out in during the holidays. I didn't even purchase any holiday items, but I came home covered in glitter and smelling of pine. Regardless, the cashiers at JoAnn's that I go to (on Logan and Elston) has the purchasing down to a fine science. Everytime I go in there, there is a significantly long line to the back of the store. BUT! You can make in through to the front of the store within 10-15 minutes! It's crazy. In the past when I have been looking for fabric swatches, I noticed they had packs of quilting squares. This time, I was even more thrilled by my husband's eagle eyes as he pointed out that all of the quilting bolts come with quilting squares below! THIS WAS MY HEAVEN!!! Then I could choose as many of the different fabrics as I wanted based on my own color scheme or theme. I also found a plastic bin that had spools of thread in exactly the colors I needed. Now, I'm sure that some of you out there (Katie Drop) might be reading this (Pamela Taylor) who are masters of the fabric (Margaret Wenk) and long time stitchers (Bobbi Meier) and quilters, so these little finds may be of no surprise to you at all! But for the experimenting rookie, I was thrilled! One thing that did overwhelm me, however, was the variety of stuffing available! I had no idea what I was choosing- I just went around and squeezed all of the bags and checked the prices. As I was going through the checkout, I turned to Brian and said, "Well, I know we wanted to save money by making these gifts, but... " Just like any artwork, I hear the registers sing, "CA-CHING! CA-CHING!" And, like usual, I justify this larger purchase by saying to myself that I might be only using about $20 dollars worth of materials for this one project, but I know that I will have a ton of leftovers (on purpose) to make more in the future! In this, I remind myself that I am saving money later on as well as time and effort on one (or more) less trip to JoAnn's. pillow in the back (in the making). I begin my project with a little sketch of what I think this will look like. Based on that, I just start picking out different fabrics I want to use within the piece based on colors and patterns. I have also been very interested in making the pillow as tactile as possible (but also as durable as possible!). I wanted to include "loose" things, puffy things, various textures, etc. This is because it's for my niece who is 14 months old. I started with the background, the tree, and the letters (and balloon). From there, I called my mother. "So, isn't there something that you can iron on the back of the fabric so that it doesn't fray? Or so that you can have fabric on both sides?" Indeed, there are TWO products. Mom to the rescue- she headed down to visit and brought with her some Stitch Witch and a large piece of iron on something-or-another. I ended up using the Stitch Witch to sandwich fabrics in order to create the little "loose" leaves on the tree! Thanks again to mom, Betta Duffy, for bringing her pinking shears with her- what a great idea for those fall leaves!! 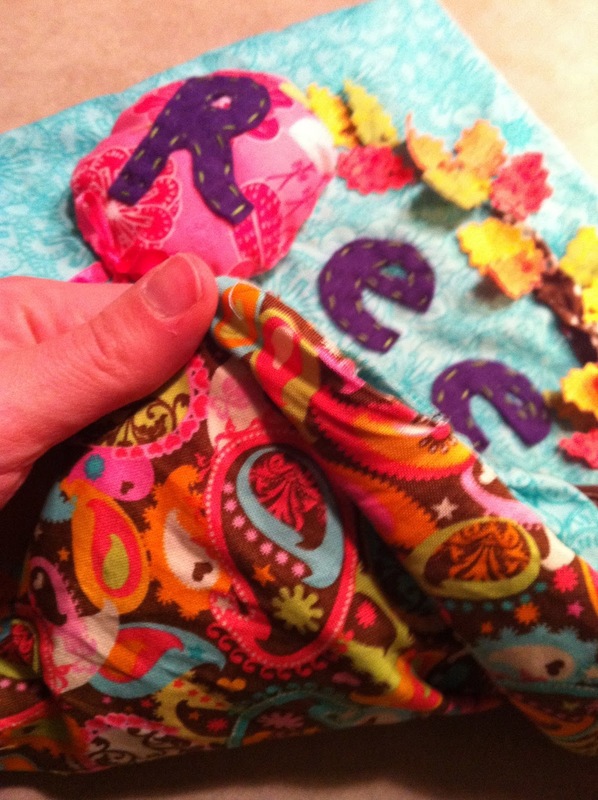 The sewn pillow "case" with the back fabric. Yes, almost the entire pillow is hand stitched together. 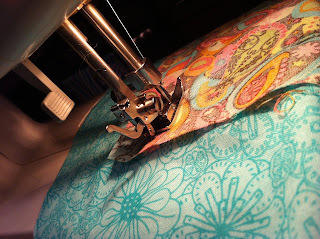 When I was almost entirely finished with the front of the pillow, I pulled out my sewing machine. Me, having a sewing machine, might be shocking to some of those who know me. 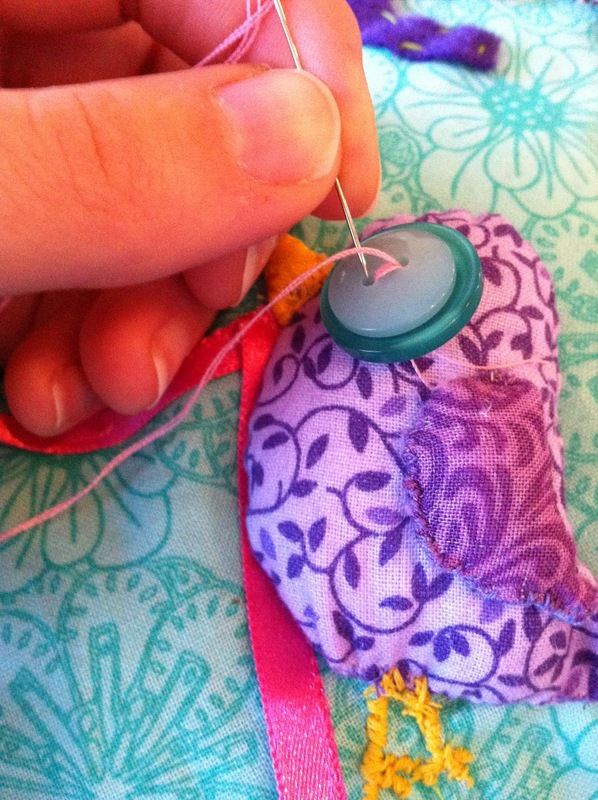 When I was a child, my mom showed me how to hand stitch. I sat in my basement for hours coming up with templates for my Barbie's next clothing line. (Ahem, you might also notice that I never did become a fashion designer... ) I would use any scraps I could get my hands on and stitch up shirts and skirts and dresses galore. One day, I asked my mom to show me how to use a sewing machine. She told me that she would, but that she was very nervous so that I would not "stitch" my fingers together!!! Well, that is a pretty traumatizing image to a 12 year old. And that was that. No sewing machine for Janet! It was not until I was in college that I learned how to use a sewing machine, and it wasn't until my days working as a scenic artist in New York City that I really learned how to use a sewing machine and a serger (to make bags for our extra drapery). While living in Brooklyn, I bought my first sewing machine and made drapes for my apartment. I was even so daring as to make shears for the apartment windows (which proved to be far more difficult that first anticipated). Filling and the finishing touches. Adding the nested button eyes. Once the front and back were stitched together (leaving about and inch and a half of the seam unstitched), I flipped the pillow case right side out and began stuffing the pillow. This is where I stopped. I took a good look at the front and decided that there were a few more additions needed, and a bit more reenforcing to certain parts of my stitching (like the puffy tree!!). After all, a one-year-old was receiving this present! I added stitching to the tree and I added more leaves to the bottom and to the top left corner, (with some more hand stitched branches). 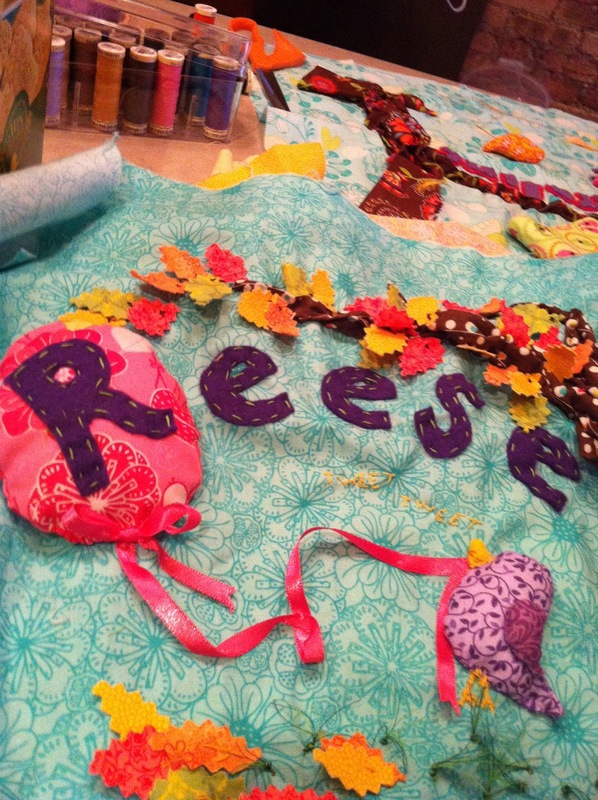 I also stitched in Reese's birthday in the center, and nested buttons for the eye of the bird. 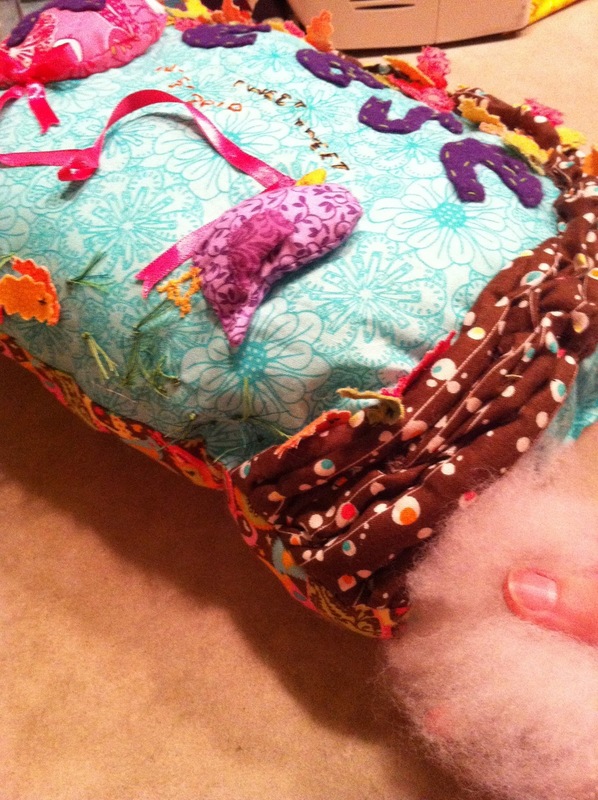 Lastly, I stuffed the pillow, and stitched up the side! I added a diagonal yellow tag stitched from the bottom to the side that says, "Made with love: Aunt Janet. Christmas 2011"
Keep an eye out for more... I'm in the process! 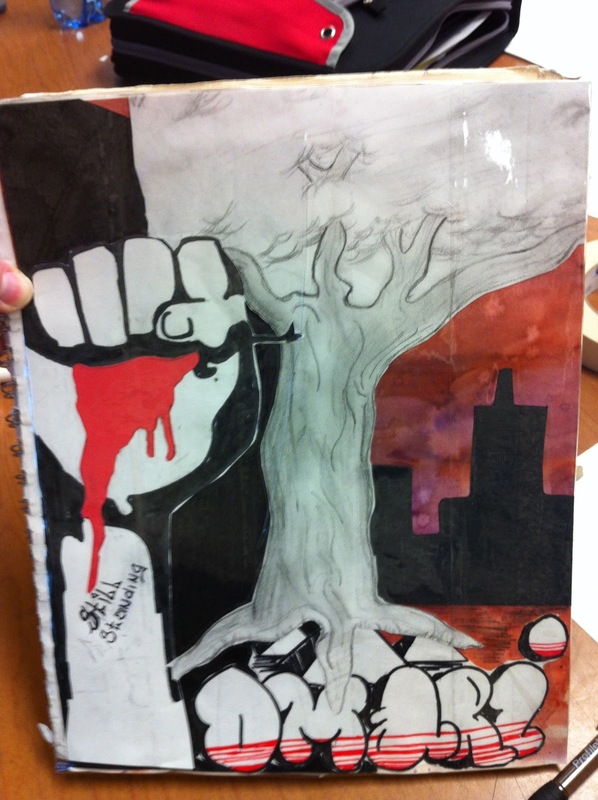 My example: I focused on the elements of Value, Color, and Line. 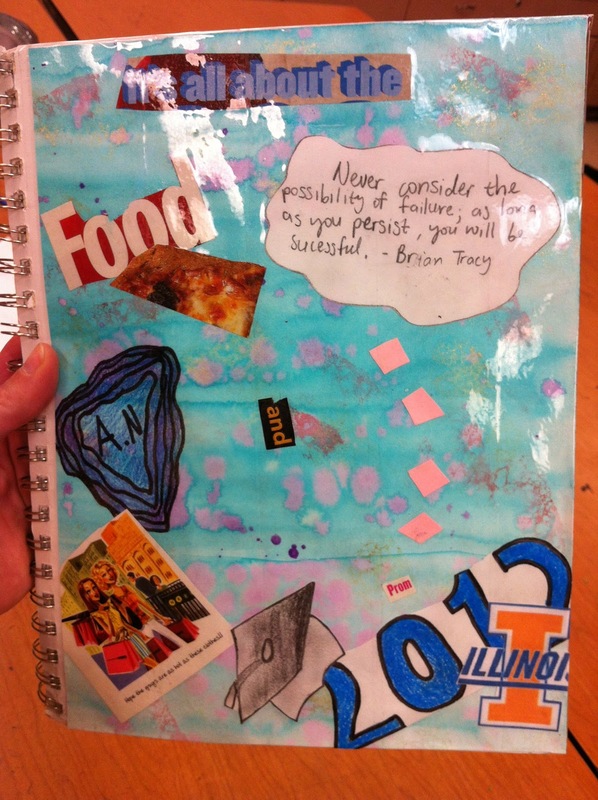 Over the past four weeks, I have been teaching the process of art-making to my students. One of the biggest complaints I hear from my students is "Why do we have to do this?" But, if we don't "do this" I always hear, "I can't do this. I don't know what to do!" In the first week, I attempted to put the kibosh on the second question/issue... and in fact spent a full week hearing about the first. I first explained how artists come up with ideas through brainstorming, associating, symbolism, then how they begin to create artwork through planning and choices. Our artwork? 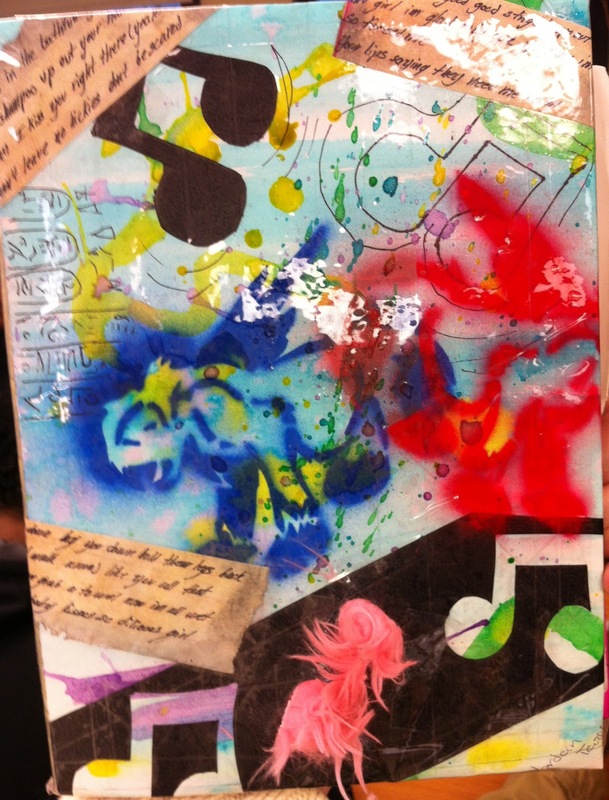 An Identity Collage that would become a significant piece of artwork- their signature, really... Their Sketchbook Cover! 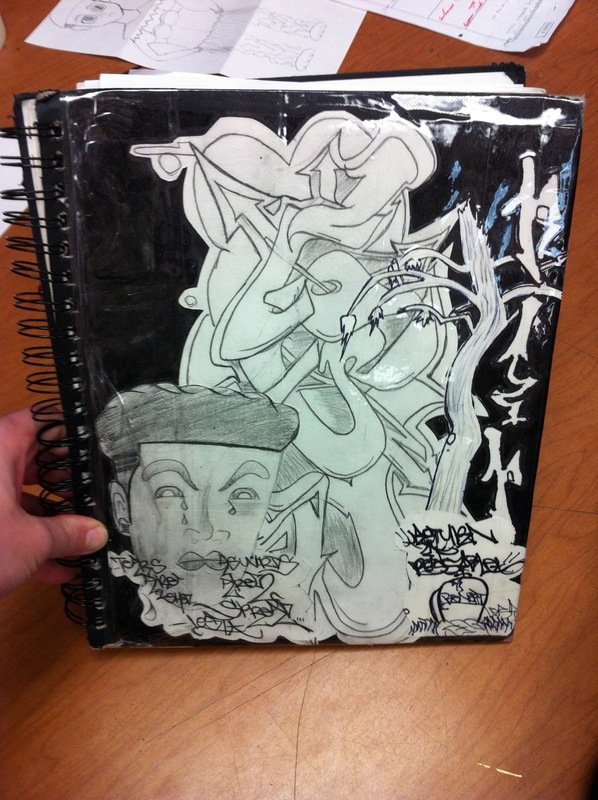 Over the past quarter, students have mainly been working on exercises and small projects mostly within their sketchbooks. This was a way for students to use what they have learned over the past quarter to create a piece of artwork that was truly, uniquely all their own. Students answered questions about themselves (which they were really into! ), created a word web to help come up with visual examples (that they could include in their collage), that was all about who they REALLY are. One thing I did emphasize during this discussion is that we are always changing our identity, and that parts of our identity are hidden or disclosed when around different people. Students were to really take time to reflect on who they are... not two years ago, not once they graduate high school, but right now, this minute. Students were surprisingly incredibly honest with themselves! music notes as well as with the stencil. Oh the woes of planning your own lesson. cool colors to create emphasis in her piece. I suppose I'm still getting use to my students and what to expectfrom them. That isn't to say that I won't continue to push them to the next level. However, I think that the more I teach, the better I will get at trying different tactics to help my students "see." 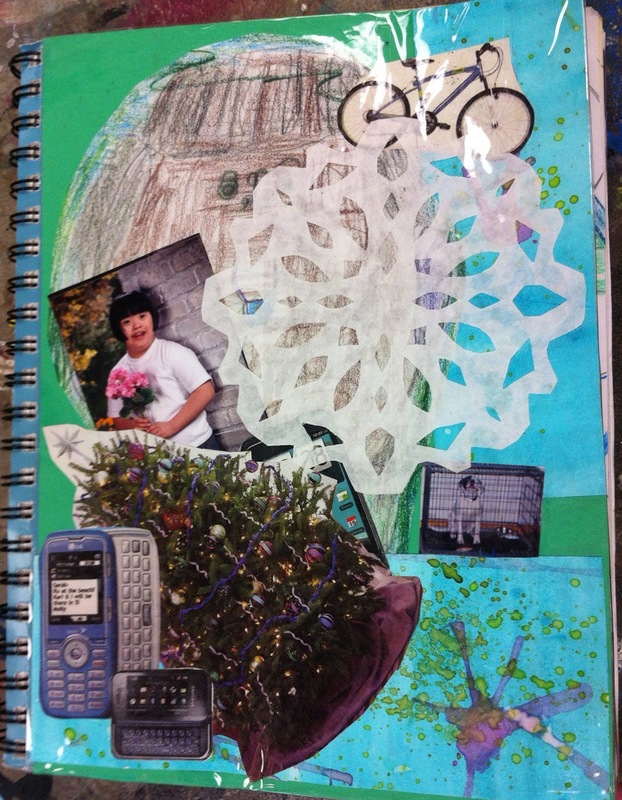 No matter how many examples of collages I showed them, no matter that I worked on my collage along side them and pointed out various aspects along the way, no matter how I repeated, reviewed and emphasized composition and other areas of importance each and every day, I still had quite a few students who didn't seem to quite "get" the concepts. Now, I'm still unsure of how many didn't necessarily "get" the concepts... or how many (I'm sure quite a few) could not simply care less. Many students, I think, just wanted to glue things on the paper and were quite happy with that. Maybe I should be more pleased with this than I was? 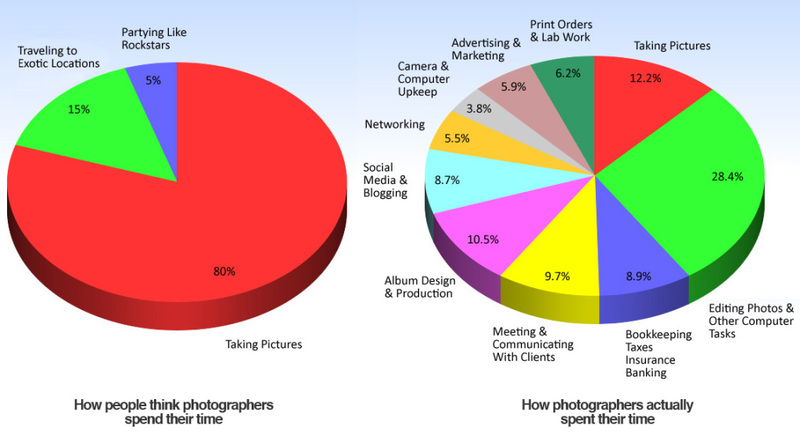 Last year, I taught 5 classes of photo 1. I found a really great pace with my students. I pushed them when they needed to be pushed, and slowed down when they needed to slow down. I found I was able to get some really outstanding artwork out of these students. This year, however, I am really struggling with what I should be defining as success. As I mentioned in a previous post, I am finding myself more closely connected with having social and behavioral successes with my students this year than I have had to in the past. actually states that he hates collaging). like his use of the grayscale and red palette. What would I do differently? I think that because this is such an identifying piece of artwork, I would probably just make this a two week assignment in the beginning of the school year. 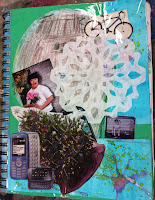 I would introduce collage and talk about the different ways one can collage. Then, let the students have at it, guiding and reviewing along the way. 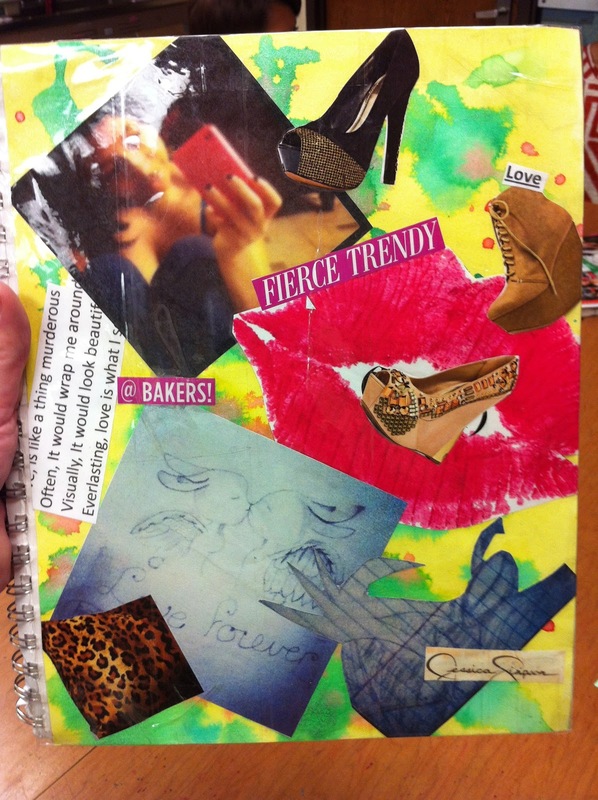 This would be a really great beginning project because students (I think) will take ownership of their sketchbook right off the bat. It will also give me a chance to see where students' talents/abilities are, and since students are moved in and out of my classes very frequently in the beginning, students who come in later would not feel as though they have missed a lot (easy for them to catch up). Students still had a difficulty with composition and overlapping items, so I would probably do a composition exercise as well. Did I mention that I also teach autistic students? Well, it certainly does present a whole other set of challenges when teaching a class of 35 students, when 14 of them (2 groups of 7 in 2 of my classes) are autistic! 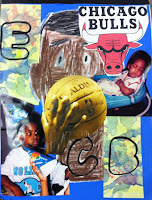 Depending on these students' abilities, I had them create a collage using small assignments in class. For example, I had students draw pictures of themselves, or of themselves doing their favorite activity. The aid(s) helped a ton by employing parents to bring in photos or magazine clippings or 3D objects that related to the students. They were still required to create a watercolor piece to include in their project as well, and were able to follow my basic instructions. Here are a few examples of their pieces! I love the use of the puzzle pieces, and the outlines of bubble letters, and other overlapping items.